1. I hate writing about Israel. The accusations of anti-semitism which necessarily go along with literally any criticism of that nation are gross enough, but even worse are the assholes who take my criticisms of the Israeli government as an invitation to actually be anti-semitic. They really do hate Jews, they really do think that every problem in the world is because of Jews and they post Jewish caricature memes and calls for genocide in the comments section on social media and it’s incredibly gross and I hate it. But the Israeli government keeps committing war provocations and massacring Palestinians, so it’s something I’ve got to talk about. 2. Anti-semitism (or whatever word you prefer to use for the pernicious mind virus which makes people think it’s okay to promote hatred against Jewish people) is a very real thing that does exist, and I denounce it to the furthest possible extent. Anti-semitism is also a label that is used to bully the world into accepting war crimes, apartheid, oppression, and mass murder. Both of those things are true. 3. There were dozens of Palestinians killed and well above a thousand injured in the Gaza protests over the US moving its embassy to Jerusalem yesterday. 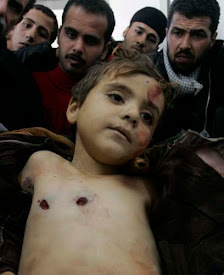 I haven’t found any report of so much as a single Israeli injury. The only way to spin this as the fault of the Palestinians is to dehumanize them, to attribute behaviors and motives to them that we all know are contrary to human nature. To paint them as subhuman orc-like creatures who are so crazy and evil that they will keep throwing themselves at a hail of bullets risking life and limb just to have some extremely remote chance of harming a Jewish person for no reason. This is clearly absurd. A little clear thinking and empathy goes a long way. 4. Trump could have prevented all this violence by doing what previous administrations had done and keeping the US embassy in Tel Aviv. Experts warned that this would happen. Trump ignored them. He is ultimately responsible for the mounting pile of corpses resulting from this provocation. 5. The Trump campaign was given $25 million by billionaire oligarch Sheldon Adelson (the largest campaign donation made by anyone to any candidate), who provided a further $5 million for Trump’s inauguration. Adelson is a sociopathic pro-Israel hawkwho once called on the US to drop a nuclear bomb on Iran. He was present at the opening of the Jerusalem embassy, getting what he paid for. 6. Any position on Israel that is determined by words allegedly spoken by dead men thousands of years ago is intrinsically invalid. Saying the Jewish people are more entitled to Israel than those who were living there seven decades ago because of some superstitious voodoo written in obsolete religious texts is not an argument.Religious freedom is important, and it’s important to be able to believe whatever you like, but your beliefs do not legitimize the brutalization of other people. If you murder someone in the name of Allah, you have murdered someone. If you kill 58 people because you feel some ancient scripture entitles you to a particular section of dirt, you have killed 58 people. Your internal beliefs do not give you a free pass for your egregious actions upon others. 7. Israel is very dangerous and completely unsustainable, but its interests are aggressively promoted by powerful plutocrats and lobby groups. It’s like if fracking was a place. 8. A nation that can’t exist without nonstop war and violence is like a house that can’t stand without nonstop construction work. If your house needs a large construction team working around the clock seven days a week to keep it from collapsing, you should probably either move or consider a new architectural design. 9. A nation that can’t exist without nonstop war and violence is not a nation at all, (looking at you too America) it’s a decades-long military operation with a few suburbs sprinkled on top. And that is exactly how Israel has functioned since its creation: as a nonstop disruption campaign that the post-World War Two western victors dropped on top of the Middle East just as humanity hit new heights of oil dependence. By 1967 Israel came within inches of a possible third world war with America’s only rival superpower, the Soviet Union, and today we have Israel leading the charge in the western empire’s regime change agendas against Iran and Syria. It’s been a consistent pattern. 10. There’s good conspiracy theory and there’s bad conspiracy theory. People who say America controls Israel or Israel controls America are engaged in bad conspiracy theory. We don’t live in a world where the lines between nations mean anything to those with real power; in reality “Israel” and “America” are both purely conceptual constructs which only exist to the extent that people believe in them. There is no actual “Israel” which can exert control over an actual “America”, and vice versa. It isn’t nations and governments pulling the strings of real power in the world, it’s a class of plutocrats who aren’t ultimately answerable to any government. This class of plutocrats uses governments like Israel, the US, the UK, and the KSA to advance its agendas to exploit, loot and plunder the rest of humanity. 11. The western empire is a cluster of tightly allied nations held together by contracts and manipulation which often function more or less as a single unit on foreign policy, war, intelligence, trade, etc. What we call Israel is functionally just the Middle Eastern disruption wing of this empire. The people in control of this alliance place no special value on Israel beyond its usefulness in advancing plutocratic agendas in the Middle East. 12. People make a big deal about Zionism in conspiracy circles, but Zionism is just one more tool of manipulation used by the elite class which only ever cares about power. The people who are actually calling the shots in this world don’t care about Judaism or the Jewish people; Zionism is just a set of ideas they use to move people around. They use Christian fundamentalism, Islamic fundamentalism, white supremacy and secular liberalism in the same way. It’s always about acquiring more power for the western oligarchs, and their insatiable drive in this pursuit is how they wound up at the top of the western power structure. They’ll use any set of beliefs to manipulate the masses toward this end. 13. Since Israel plays such a crucial role in the agendas of the western power establishment for such a key strategic region, it should be no surprise that the people who lived on that land before Israel was dropped upon them get trampled underfoot. As far as the powerful are concerned, the Palestinians are no different from the animals whose habitats are destroyed by a new military base, or the whales that get killed by navy sonar experiments. They’re a nuisance to be swatted away. 14. The reason for the extreme brutality that is being used against the Palestinian demonstrators appears to be the same as that used by the Chinese government in the Tiananmen Square massacre or the lynchings of the segregated American south: to send a message. That message is “Here is how we will deal with you whenever you hold these demonstrations.” They’re quashing the protests so violently and so aggressively not out of self defense, but to dissuade such protests in the future. 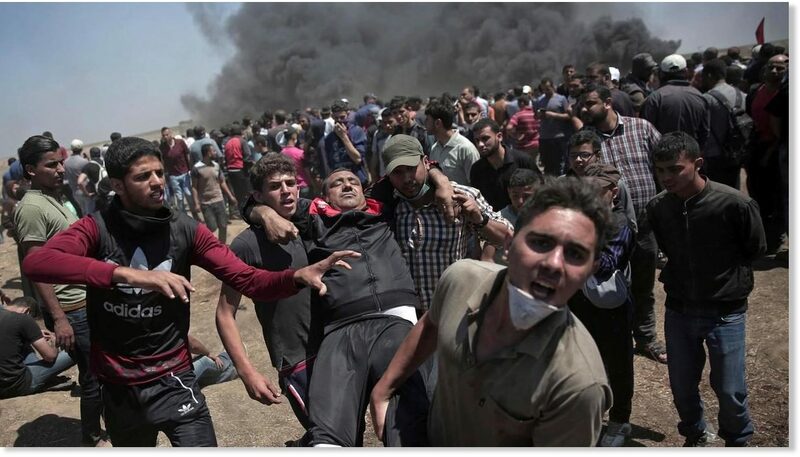 All they have to do is be brutal enough to convince the Palestinians that such protests aren’t worth the cost of life, and whole generations could be dissuaded from future protests.